Scientific Note: The frog, Eleutherodactylus sanguineus, was identified by the authority Lynch in 1998. It is endemic to Colombia and has not been verified to exist in Haiti. Its natural habitats are in the subtropics or tropics. It is found in moist lowland forests, moist mountains, and rivers. If you are inclined to search for these frogs yourself, they are found only in the darkest jungles. You might be better off to avoid searching in the jungles of Haiti. Mayra Montero’s novel In the Palm of Darkness is set in Haiti during the harsh dictatorship of Papa Doc Duvalier who ruled brutally, enforcing his powers through fearsome thugs known as the Tonton Macoutes. I came across the novel while searching the web for reading material to take on a 2008 birding expedition to Belize. I enjoyed reading it it in Spanish in our hotel in the Guatemalan jungle near the Mayan ruins of Tikal. This novel gives a dramatic look into the strange workings of scientists who collect data in the field and tells the fascinating story of a local guide Thierry who did not fear taking a field zoologist into a remote and forbidden corner of the jungle. The reader will encounter Thierry’s father who was a vampire hunter until a howling pack of vampires left him dying in a tree and meet Thierry’s half brother who joined the Macoutes and ended up insane.This is also the story of his Thierry’s cousin Frou Frou desired by both Thierry and his father. The driving force behind this novel is the tale of the herpetologist Victor who travels to Haiti to document and tape the call of a rare, never before documented, frog. “Don’t you think Haiti is a dangerous place for expeditions”, his wife asks. He answers: “Nothing very serious can happen to a man when all he looks for, all he wants, is a harmless little frog.” But his faith in the invincibility of science is shaken when Thierry finds out that the illusive frog he seeks was last seen in a Tonton Macoutes graveyard deep in the darkness of the Haitian Jungle. The story is told in the words of Victor as he works gathering data so the reader is assured that somehow he will return to civilization alive. Woven into the story is the family history of the guide Thierry whose oral history is taped by Victor during the long nights the two spend listening for frog sounds. The illusion of the safety of scientific workers should have been shattered immediately when Victor and Thiery discovered that their preferred expedition site was still being used by the Macoutes to bury their horribly mutilated victims. But, reality was brushed aside when the rare frog was heard croaking nearby—too good to pass up. The thugs were not deterred, however, and came after the scientists with machetes. Escaping the mountain under cover of darkness Victor fires Thierry because of Thierry’s evident lack of enthusiasm when it is suggested that they return to the graveyard. Thierry isn’t that easily put off because cash paying work is hard to find in Haiti. He convinces Victor to try another research location that might be less dangerous. Thierry says he heard the searched for frog there many years before and convinces Victor to continue. At the new site they meet American field biologist Sarah who is searching for a rare female cactus—the last of its species. However, the new site soon must also be abandoned because of the threat of violence then endemic throughout Haiti. Sarah refuses to leave, hoping that she has a few more days to search, but Victor and Thierry flee. As foretold by the author in the first chapter of the book, it is not the fate of Victor to die in the jungle. However, the roads are blocked and the novel ends with the Victor and Thierry boarding an ill-fated ferry named Neptune with their research results. The plot is a little thin, but the characters are well portrayed and the environmental and political insights are thought provoking. About the Tonton Macoutes—The Haitian militia/secret police force, MVSN, was created in 1959 by François ‘Papa Doc’ Duvalier,. Intimidation, threats and violence were a signature of the MVSN; who were referred to by the Creole term Tonton Macoutes, which is equivalent in Haiti to the “bogeyman”. Good Haitian children are rewarded at Christmas by Tonton Noel or Uncle Christmas. However, the bad children are snatched off by Uncle Gunnysack, Tonton Macoute. Another Note: Like many frogs this tiny tree frog of this novel, Eleutherodactylus sanguineus, is threatened by habitat loss. It is similar to the members of the Coqui family of frogs found in Puerto Rico and closely resembles the Chiriqui robber frog, Eleutherodactylus cruentus. 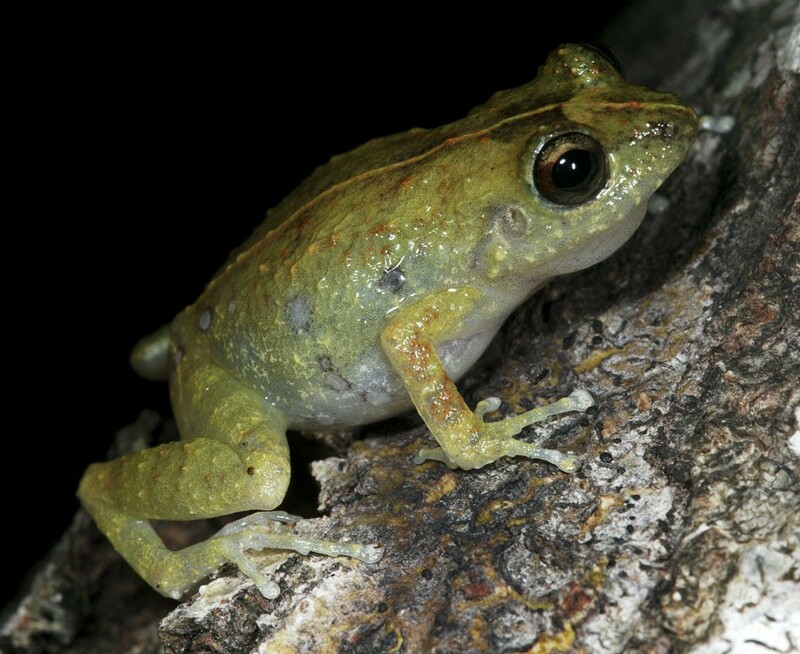 The robber frog has small nubs (tubercles) on top of eyes, and mottling of yellow patches in groin. Day 29: In the Palm of Darkness: A Novel (Mayra Montero), Spanish title: Tu, La Oscuridad (1998). This entry was posted in Fiction, Spanish, Translation and tagged postaday2011. Bookmark the permalink. Why would I not want to search in the jungles of Haiti? Colombia and neighboring Dominican Republic have higher crime rates then Haiti does and thats fact, so im puzzled. Anyways, lots of rare creatures in the remote Haitian forests. Yes there are lots of rare creatures, but they may be disappearing. The state of the environment and the state of conservation in Haiti is not good. The following was recently posted in Time.